1. Whisk eggs in a bowl. 2. Add breadcrumbs to a separate bowl. Season with salt and, if desired, Italian spices. 3. Slice the tomatoes about 1/4" thick. 4. Heat 1/4" of vegetable oil in a pan over medium heat. 5. While the oil is heating up, dip and thoroughly coat tomato slices in eggs, then transfer to the bowl with breadcrumbs and coat with breadcrumbs. 6. Carefully place breaded tomato slices in the hot oil using tongs. Cook for 3 minutes per side. 7. Remove tomato slices and place on a plate cover with a paper towel to absorb excess oil. 8. Serve hot with a side of marinara and/or ranch dressing. I bet you’ve heard of fried green tomatoes, but have you ever tried them? Just add a side of marinara sauce and you’ll be wondering how spent all these years not knowing the goodness that is a fried green tomato. Green tomatoes are actually a little rare. As a first-year gardener I now understand why fried green tomatoes are a thing. If you have a garden or have ever gardened, then you know what I’m talking about. Nurture a few seeds into plants and before you know it, you get inundated with fresh veggies—particularly tomatoes— come harvest season. An abundance of vegetables seems like a good thing but it can actually be somewhat overwhelming. Of course, you can give away some of your tomatoes and other veggies but sometimes people are already overloaded with tomatoes from their own garden or they’ve already been given vegetables from another gardener friend of theirs. And tomatoes don’t last all that long. So… what’s a gardener to do? Pick some of those tomatoes when they’re still green! Tomatoes are absolutely edible when they’re big and green even though they aren’t fully ripe. Green tomatoes can be used instead of red tomatoes in almost all recipes. The difference to keep in mind is that their flavor is a little more tart and they are much more firm. What makes green tomatoes good for frying? The fact that they are firm is actually what makes them perfect for frying. This is most likely why, when you think of green tomatoes, the first recipe that comes to mind is the classic—fried green tomatoes. Their firm state holds up really well when fried and the heat softens them just enough so the end result is a crispy, melt-in-your-mouth fried tomato. Could you fry a red tomato? You can fry red tomatoes. However, the end result is going to be a lot more squishy and potentially watery so you might loose a bit of that crispy coating that makes them so good. 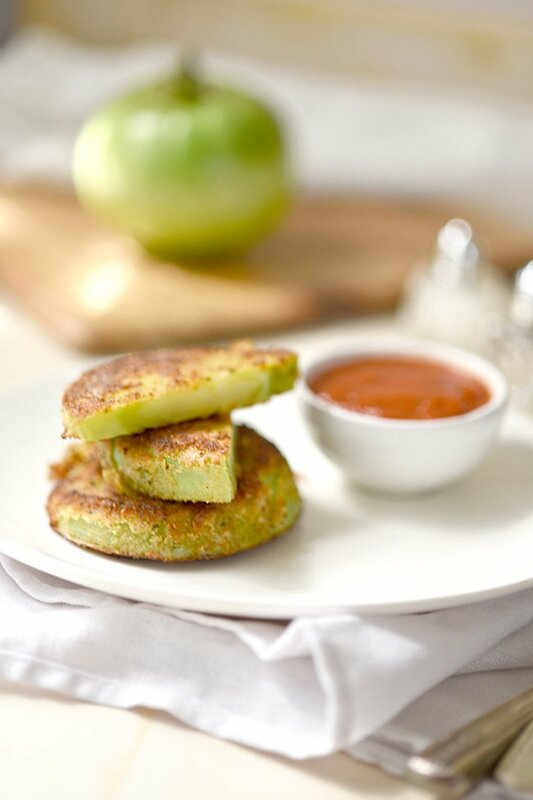 What sauces goes well with fried green tomatoes? You may be wondering if there’s a sauce that goes well with fried green tomatoes. Why yes, there is. 🙂 My favorite is marinara sauce. You could also try ranch dressing. If you’re looking to get some mileage out of these, you can turn your fried tomatoes into a full casserole. Start with cooked pasta, layer on marinara sauce, top with fried green tomatoes, layer on mozzarella cheese and then bake at 400˚ until the cheese is melted. Yum! A nice little vegetarian meal. Making fried green tomatoes is really easy but you will need a few tools. Want more idea for processing your garden tomatoes?